Quality you can count on at any RIU destination. The perfect choice for any vacation style. Riu Republica: Splash Water World opening November 2017. Riu Dunamar: Family friendly resort opening December 2017. Budget-friendly resorts for families and adults-only. Save up to 60% + get up to $300 in instant savings + get up to $2,190 in resort coupons. Book a flight + RIU Hotels & Resorts vacation package of three nights or more, and save up to 60%1 and get up to $300 in instant savings*. Plus, stay four nights or longer at select resorts and get up to $2,190 in resort coupons^ to enjoy during your stay. Restrictions and exclusions may apply. Resort coupon offer valid at select resorts. There is no better time than the present to plan your next tropical escape. At RIU Hotels & Resorts, there is something for everyone. From a fun family getaway to a romantic wedding or honeymoon, the choices are endless. An all-inclusive experience includes spectacular live shows and music, various options for unlimited dining, unlimited beverages, water sports, beach activities, and much more—all at no additional cost. New resort. Opened November 2018. Free sun loungers on beach. Free access to Splash Water World Aquatic Park. RiuLand kids club and baby pool. Cappuccino, coffee, and ice cream parlor. Elegant wedding and honeymoon hotel. Resort exchange privileges: Stay at one, play at five. Details provided at hotel check-in. New resort. Opened December 2018. Located in front of the heavenly El Médano beach, on the south of the Baja California peninsula. Resort exchange privileges: Stay at one, play at three. Details provided at hotel check-in. An all-suite and junior-suite resort. Resort exchange privileges: Stay at one, play at two. Details provided at hotel check-in. Beachfront hotel in multi-resort RIU Complex. Resort exchange privileges: Stay at one, play at four. Details provided at hotel check-in. Ideal for family and friend getaways. Shopping strip within walking distance. Beachfront hotel set on a very quiet and expansive bay. Packages at these featured hotels include food and beverage, entertainment, activities, and more. 1Hotel savings vary depending on date of travel. Three-night minimum stay required. *Instant savings value at these resorts varies depending on length of stay. Stay three or four nights and get $150 in instant savings. Stay five or six nights and get $225 in instant savings. Stay seven nights or more and get $300 in instant savings. Three-night minimum stay required. ^Resort coupons are issued for limited discounts on select amenities including spa services, wedding packages, and more. Four-night minimum stay required. Savings require purchase and balance of the remaining amount will be paid directly to the hotel. Resort coupons will be subject to 16% taxes and fees for amounts redeemed. These coupons are issued per room, valid for guests 21 years of age or older, are non-transferable, and any remaining credit is forfeited at the end of the stay. This promotion is subject to availability and can change without previous notice. Some restrictions apply. Riu Palace Baja California: Stay four to six nights and get up to $640 in resort coupons. Stay seven nights or more and get up to $740 in resort coupons. Riu Palace Jamaica or Riu Palace Tropical Bay: Stay four to six nights and get up to $470 in resort coupons. Stay seven nights or more and get up to $600 in resort coupons. Riu Palace Punta Cana or Riu Palace Bavaro: Stay four to six nights and get up to $1,335 in resort coupons. Stay seven nights or more and get up to $2,190 in resort coupons. Riu Palace Pacifico: Stay four to six nights and get up to $890 in resort coupons. Stay seven nights or more and get up to $1,290 in resort coupons. Riu Palace Aruba: Stay four to six nights and get up to $700 in resort coupons. Stay seven nights or more and get up to $800 in resort coupons. Riu Palace Paradise Island: Stay four to six nights and get up to $750 in resort coupons. Stay seven nights or more and get up to $950 in resort coupons. Riu Palace Costa Rica: Stay four to six nights and get up to $910 in resort coupons. Stay seven nights or more and get up to $1,370 in resort coupons. Relax, play, or do a little of both. At the all-inclusive accommodations of RIU Hotels & Resorts, there is something for everyone. From a fun family getaway to a romantic wedding or honeymoon, the choices are endless. An all-inclusive experience includes spectacular live shows and music, various dining options, unlimited beverages, water sports, beach activities, and much more--all at no additional cost. Whether you want a relaxing adult-only experience including indulgent treatments at the Renova Spa or an exciting time with the kids at the RiuLand kids program, RIU Hotels & Resorts has it. Experience the ultimate all-inclusive vacation package at Riu Palace Peninsula. Located on a gorgeous stretch of Cancun’s white-sand beaches, this breathtaking resort is surrounded by both cool, clear waters and a lush tropical landscape. From relaxing treatments in the Renova Spa to exciting beach activities and water sports, guests of all ages will find plenty to keep them occupied. If you’re traveling with the whole family, the little ones will want to check out the RiuLand program. Planning a romantic getaway? Riu Palace Peninsula features an adults only area with Deluxe Villas. The hallmark of the all-inclusive Riu Palace Las Americas, as with all RIU Hotels & Resorts, is a focus on attentive and personalized service. Guests can take advantage of the beautiful Cancun weather with a variety of amenities including a fresh water swimming pool, serene beach, and plenty of room for outdoor activities and water sports. A variety of delicious dining options means that you can enjoy everything from traditional Mexican cuisine to Japanese and everything in between. All-inclusive means that you can enjoy all of your meals, snacks, and beverages at no additional cost! 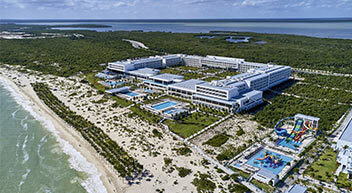 The white sand beaches and clear blue waters of Cancun are home to the recently renovated Hotel Riu Cancun. Guests of all ages will enjoy this all-inclusive tropical paradise and all of the luxury accommodations and amenities it has to offer. Spend your days on the beach, tennis courts, or around the pool; and spend your nights enjoying a live show or dancing to local rhythms. If you want to explore everything that the area has to offer, enjoy the surrounding tropical environments with excursions or a popular tour of the Chichen Itza Mayan ruins. Create your ideal Mexico vacation at Riu Cancun. This all-inclusive hotel is located on the beautiful beaches of Cancun, and boasts breathtaking views. Whether you are looking for an active vacation full of outdoor activities, watersports, snorkeling, and golf; or you prefer a relaxing getaway full of spa services and leisurely dining experiences, there is something for everyone at Riu Caribe. Get a taste for local flavors with traditional Mexican recipes, nightly live entertainment, and exciting island excursions. Riu Caribe is the perfect destination for your next tropical vacation. Hotel Riu Dunamar offers over 700 well-appointed rooms with amenities such as air conditioning, a minibar, and beverage dispensers. At this Costa Mujeres resort, you’ll find five outdoor swimming pools with lounge chairs and umbrellas for you to enjoy the warm Mexican weather. Relax by the beach and take in its natural beauty or spend splash-filled days kayaking, snorkeling, or having a blast at the hotel’s Splash Water World Aquatic Park. At night, there are plenty of entertainment options, featuring live shows at the theater or dancing at Pacha nightclub. This all-inclusive hotel in Costa Mujeres has 670 junior suites and suites with the finest amenities, such as a minibar, 24-hour room service, and a balcony or terrace. The facilities at the Hotel Riu Palace Costa Mujeres also include five swimming pools – two of them with swim-up bars, so that you can enjoy a refreshing dip after relaxing in the solarium lounge chairs. Guests also enjoy complimentary access to Splash Water World Aquatic Park or Pacha nightclub located next door at Riu Dunamar. Combine white sand beach, crystal clear water, a palm tree landscape, and a luxury all-inclusive resort with spacious and comfortable accommodations, and you’ll get Riu Palace Riviera Maya. Dine in a variety of restaurants while enjoying delicious culinary creations from creative chefs. Use the rest of your day to explore your surroundings, enjoy live entertainment, indulge in spa treatments, or take part in sports and activities under the sun. A perfect destination for families, kids will love the RiuLand program while adults enjoy some alone time. Create lasting memories at this tropical oasis, and make Riu Palace Riviera Maya the destination for your ideal Mexico vacation. The all-inclusive experience that you will experience at Riu Palace Playacar is defined by high quality service, friendly staff, beautiful surroundings, and endless entertainment. Relax poolside, challenge your friends to a game of tennis, enjoy delicious cuisine, or dance the night away to live music. Riu Palace Playacar has amenities that will keep the whole family enjoying a fun-filled vacation. If you want to explore more of the local culture, try an excursion to Mayan ruins or the Crococum Zoo. With a décor to match traditional Mexican estates, Riu Palace Mexico is the perfect place to escape for a beach getaway. Families will love the RiuLand kids’ club, activities, comfortable accommodations, and live entertainment; and couples will enjoy the Renova Spa, gourmet dining, and Whirlpool bath suites. With plenty of dining options, you can try something new each day. Sample local fare at Don Julian one night and get a taste of Italy at La Dolce Vita the next. When the sun goes down, head to Los Mariachis for a nighttime cocktail. Your Riu Palace Mexico vacation package is only a click away. Riu Tequila is an all-inclusive tropical paradise surrounded by a palm grove and the perfect destination for families, friends, honeymooners, destination weddings, and everyone in between. Relaxing treatments at Renova Spa, a night of dancing at La Piñata club, a delicious Mexican dining experience at Jalisco, and comfortable accommodations are just the beginning. Riu Tequila is home to an all-inclusive experience and all-star service that will leave you with lasting memories and the vacation of a lifetime. Once you feel the soft sand under your feet and the cool ocean breezes gently blowing over you, you’ll know you’ve finally found Riu Yucatan and the perfect destination to experience your all-inclusive Mexico vacation. If you’re looking to take relaxation to a whole new level, visit the Renova spa for heavenly treatments. If beach adventures are more your speed, you’ll find the perfect setting for water sports, windsurfing, snorkeling and much more only steps away at the beach. After working up an appetite from a full day of activities, you can enjoy the fresh ingredients and flavors of a variety of dining options. Riu Yucatan didn’t foget about the little ones! The RiuLand program has everything to make sure that kids enjoy their vacation just as much as the adults. Book your Riu Yucatan vacation today. Located in the south of the Baja California Peninsula and merely minutes from the famous Cabo San Lucas, Riu Santa Fe is a lively resort where you’ll never find a shortage of activities to keep you busy. During the day, take part in beach activities including volleyball, windsurfing, kayaking, and bodyboarding; or relax in the Renova Spa while you enjoy a personalized spa treatment. When the sun goes down, dance the night away at Pacha club or enjoy live shows and music. As a part of your all-inclusive experience you can enjoy recipes from around the world at a variety of restaurants and beverages of all kinds. Your sunny Riu Santa Fe vacation package is only a click away. Located in Cabo San Lucas, Mexico, Riu Palace Cabo San Lucas is surrounded by splendid gardens and situated on a gorgeous stretch of Mexican shoreline with breathtaking views of the crystal clear water. Riu Palace Cabo San Lucas is the perfect destination for travelers of all tastes and styles, and offers an all-inclusive experience that will give you plenty of options for daily dining, activities, and accommodations. Whether you want to relax in the spa or find an exhilarating beach adventure, Riu Palace Cabo San Lucas is the perfect all-inclusive destination. This all-Inclusive hotel in Cabo San Lucas has everything that you may need for a couples getaway. Riu Palace Baja California offers over 600 rooms accentuated with pedestal tubs and additional amenities such as a flat screen TV, 24-hour room service, a minibar, and beverage dispensers. Enjoy the warm weather, cool off at one of the four hotel pools – two of which have swim-up bars, or head for a day of relaxation at heavenly El Medano Beach. Surrounded by lush palm groves and the Pacific Ocean, Riu Jalisco offers an all-inclusive system, service, and facilities that will create the perfect Mexico vacation package. Enjoy the luxury resort experience with two fresh water pools, sauna, Renova Spa wellness centre, exchange privileges with Riu Vallarta, and golf inclusions. If you are looking for a little more excitement, you’ll find that Riu Jalisco’s location between Sierra Madre and Banderas Bay make it a nature lover’s paradise. Swim with dolphins or go whale watching in the bay or head to the Sierra Madre for horseback riding and bungee jumping. With all of this excitement, you’re bound to work up an appetite. With Riu Jalisco’s all-inclusive system, you can experience Mexican cuisine at its best. With free Wi-Fi in resort public areas, you can always stay connected. Discover the pleasure of calm beaches, sun, and nature at Riu Jalisco. If you are looking for luxury in one of Mexico’s most exciting destinations, then you’ll want to explore Riu Palace Pacifico. Feel your stresses melt away as you enjoy personalized spa treatments. Discover tropical adventures with windsurfing, kayaking, golf inclusions, and other excursions, or let the little ones have their own free time at the Riu Land program. Stay connected with free Wi-Fi throughout the hotel. Exchange privileges at Riu Vallarta and Riu Jalisco mean that you can explore more of Puerto Vallarta. From poolside drinks to a gourmet meal at La Peninsula, the Riu Palace Pacifico all-inclusive system will allow you to enjoy a variety of flavors. Free weddings, gorgeous surroundings, and a romantic atmosphere make Riu Palace Pacifico the perfect place for you destination wedding. Book your Riu Palace Pacifico and prepare for beachfront fun for the whole family. Riu Vallarta combines the typical RIU style with a modern Art Deco flare to create one of Mexico’s most unique resort experiences. With all of the facilities that you’ll need to create the ultimate all-inclusive vacation experience, Riu Vallarta is a destination for the whole family. And, with exchange privileges at Riu Jalisco, you can enjoy the facilities of two resorts. Relax with a cool dink poolside, indulge in spa services at the Renova Spa, hit the links for 18 holes of golf, or dance the night away at Pacha club. Eco-tourists will love the large selection of excursions from whale watching and swimming with dolphins to bungee jumping and horseback riding. When you get hungry, head to one of many delicious dining option for some local flavors. Check your email or send photos to your friends with free Wi-Fi throughout the resort’s public areas. Don’t forget to head into town to pick up some local souvenirs! Your Riu Vallarta vacation package is just a click away. All Jamaica vacation packages include flight service into Montego Bay (MBJ). Located right on the beach and surrounded by incredible scenery, the Riu Reggae is a new, all-inclusive adults-only hotel in Montego Bay, Jamaica. With idyllic surroundings and a wide array of services and amenities, including free Wi-Fi, sparkling infinity pools, a complimentary gym, and pampering spa facilities, this resort is the perfect place to experience an unforgettable vacation with your partner or friends. As an all-inclusive adults only hotel, Riu Palace Jamaica is the ultimate luxury resort for guests seeking a romantic vacation full of relaxation and tranquility. Take a dip in the refreshing pool, enjoy a beverage at the beach bar, or treat yourself to a trip to the Renova Spa. If you’re looking for a little more excitement, you’ll find plenty of activities including volleyball, snorkeling, windsurfing, sailing, and much more. High quality service is designed with your comfort and experience in mind, so simply sit back, relax, and enjoy the trip of a lifetime at Riu Palace Jamaica. As a part of the adults only experience, enjoy added values including a welcome glass of sparkling wine, concierge service, bathrobe, special wine menu (additional charge), romantic dinner on the beach (additional charge), free Wi-Fi, and premium drinks. World-famous for beautiful white sand beaches, tranquil turquoise waters, and decadent resorts, Montego Bay is home to the all-inclusive Riu Montego Bay. With a wide variety of dining options, unlimited beverages, and more activities than you can count, each day you spend at Riu Montego Bay can be a whole new experience. The entire family will enjoy hanging out at the beach, participating in water sports, and dancing to daily live entertainment. Children’s programs, swimming pool, and playground make this truly a destination for everyone. Book your Riu Montego Bay vacation package today for the Jamaica vacation you always dreamed of. Surrounded by stunning natural attractions, waterfalls, and lush forest; Riu Ocho Rios is a tropical escape in the splendid Mammee Bay of Ocho Rios, Jamaica. While staying at the hotel, your all-inclusive experience will include all meals, unlimited beverages, various sports and activities, and daily resort entertainment. A variety of room categories will ensure that you find the right fit for your escape to Riu Ocho Rios. Looking to enjoy a quiet, romantic getaway? Riu Ocho Rios features an adults only deluxe wing with private adults only swimming pool. Book your Riu Ocho Rios vacation package today. Bathed in warm sunlight and the tranquil Jamaican atmospheres of Negril, Riu Palace Tropical Bay is a Victorian-style resort decorated with immaculately manicured gardens. As an all-inclusive resort, Riu Palace Tropical Bay gives you the opportunity to sample a variety of flavors with several dining experiences including Rimini, and restaurant specializing in Italian favorites. Split your time between relaxing in your comfortable accommodations and enjoying fun in the sun at the beach or around the pool. If you want to explore more of the island, book an excursion to the Rhodes thermal springs, Hall Plantation, or Seven Mile Beach. Whether you are traveling with family, friends, or seeking a romantic honeymoon, Riu Negril is the perfect destination for everyone. This all-inclusive hotel is the perfect destination to relax, cut loose, or do a little of both. Children won’t want to leave the playground and RiuLand program, and adults will find plenty to occupy their time at the Renova Spa or one of many hotel bars. When the sun goes down, head to Pacha for a night of dancing, or retreat to your spacious room for some relaxation and a good night’s sleep. Your Riu Negril vacation package is only a click away. Experience your dream all-inclusive vacation package at Riu Palace Bavaro in Punta Cana’s beautiful Arena Gorda. This hotel’s beachfront location is ideal for water activities, poolside relaxation, and plenty of fun in the sun. When you aren’t poolside or exploring Punta Cana, grab a delicious meal at Montecristo or one of several other dining options. After dinner, dance the night away at the Pacha club or test your luck at El Millón Casino. Riu Palace Bavaro’s excellent service, wonderful amenities, and array of activities make this the perfect destination for families, honeymooners, and everyone in between. If you are looking for ultimate luxury, five-star service, wonderful amenities, and comfortable accommodations, then look no further than Riu Palace Punta Cana. This all-inclusive hotel has everything you’ll need to create your ideal tropical vacation package. Indulge in spa services at the Eternal Spa, enjoy traditional Dominican cuisine at one of many delicious dining options, or head to the beach for some relaxation under the sun or an underwater snorkeling adventure. Perfect for the whole family, you’ll want to take in everything that Riu Palace Punta Cana has to offer. Enjoy the perfect holiday at one of Dominican Republic’s most spectacular resorts, Riu Republica. Punta Cana offers a distinctive Caribbean landscape, surrounded by swaying coconut palms, sugar cane fields, and access to amazing spots such as the Altos de Chavón, Saona Island, and the Punta Cana Ecological Reserve. A vacation experience at Riu Republica offers everything you need to enjoy your time to the fullest. Make a splash in one of two large pools with spacious sun terraces, hit the gym and wellness center, or experience one of the many land and water sport options included with your vacation. Finally, end the night dancing at the lively disco or enjoying one of the live music acts included in the nighttime entertainment program. Surrounded by lush tropical landscapes and a relaxing atmosphere, escape to Riu Bambu with an all-inclusive vacation package. Riu Bambu is located on Arena Gorda, and boasts a breathtaking beachfront location and unbeatable views. With a variety of room categories, restaurants, and activities, Riu Bambu is designed to accommodate guests of all tastes and styles. Young guests will love the RiuLand kids’ club while parents enjoy the La Arena swim-up bar and Renova Spa. Book your Punta Cana vacation package today. Secluded from the busy city life, Riu Naiboa is tucked away and surrounded by a tropical landscape, lush gardens, a vast beach, and turquoise water. Ideal for a vacation full of relaxation and pampering service, Riu Naiboa is home to comfortable accommodations, several dining options, refreshing swimming pool with children’s section, and a range of different activities and water sports. If you want to explore more of your surroundings, the hotel can help to arrange exciting excursions to Marinarium marine park, Altos de Chavón, and more. Punta Cana is a beautiful Caribbean destination full of sandy beaches, tall palm trees, relaxing atmospheres, and Riu Palace Macao. While staying at the hotel, your all-inclusive experience will include all meals, unlimited beverages, various sports and activities, and daily resort entertainment. A variety of room categories will ensure that you find the right fit for your escape to Riu Palace Macao. A typical day at Riu Palace Macao might include a morning around the pool, lunch at Pancho poolside restaurant, afternoon activities on the beach, dinner at El Patio, and a little entertainment at Copacabana amphitheater. As a part of the adults only experience, enjoy added values including a welcome glass of sparkling wine, concierge service, bathrobe, special wine menu (additional charge), romantic dinner on the beach (additional charge), free Wi-Fi, and premium drinks. This elegant all-inclusive hotel is an exotic and exciting destination for enjoying a tropical Caribbean vacation. Offering two fresh water swimming pools, a health and beauty center, four themed restaurants, a thrilling casino, and daily live entertainment; Riu Palace Aruba has everything you’ll need to create your ideal island getaway. Outdoor lovers can enjoy a coastline hike, scuba diving, and watersports; while those looking for a maximum relaxation will want to take advantage of spa treatments, time in the Jacuzzi, and a cool beverage around the pool. Book your Riu Palace Aruba adventure today. This adults only all-inclusive hotel is the ideal setting for a romantic Caribbean vacation. If you are looking for a place to relax, you’ve found the perfect hotel. Grab a towel and a lounge chair, and enjoy the warmth of the Aruba sun as you sit poolside. If you are in the mood to try some new activities, Riu Palace Antillas has an extensive program full of water activities including windsurfing, snorkeling, kayaking, golf, and bicycle rental. When the sun sets, you can enjoy some delicious cuisine at the buffet-style restaurant or three themed restaurants. After dinner, escape back to your luxury accommodations or catch a live show. Your Riu Palace Antillas vacation can be anything you want it to be. As a part of the adults only experience, enjoy added values including a welcome glass of sparkling wine, concierge service, bathrobe, special wine menu (additional charge), romantic dinner on the beach (additional charge), free Wi-Fi, and premium drinks. Located in one of the world’s most famous beach destinations, Riu Palace Paradise Island is located on a gorgeous stretch of white sand beach. Defined by personalized service that will exceed your expectations and comfortable accommodations, this hotel will provide you with an experience that you won’t soon forget. Spend your time at the hotel or venture out to explore Nassau, Paradise Island where you can enjoy excursions like swimming with dolphins, scuba diving, and an array of water sports. 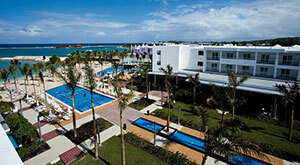 Riu Palace Paradise Island has something for everyone. All Costa Rica vacation packages include flight service into San Jose (SJO). This all-inclusive hotel boasts a stunning seafront location on the scenic Mata Palo Beach. Riu Guanacaste has embodied the Costa Rican style and flavors in a variety of themed restaurants, indulgent and relaxing spa services, and a friendly and attentive service that will ensure that your vacation exceeds your expectations. Whether you are looking forward to a romantic getaway, outdoor ecotourism adventure, or fun-filled trip with friends, Riu Guanacaste has everything you’ll need and more. Famous for its lush landscapes and picturesque beaches, Costa Rica is home to Riu Palace Costa Rica. This all-inclusive hotel will provide you with the service and amenities that you’ll need to enjoy the vacation of a lifetime. Equipped with four swimming pools, wet bar, Jacuzzi, gym, sauna, and the famous Renova Spa, Riu Palace Costa Rica is a truly all-inclusive destination. Looking for a little excitement? Try some of Costa Rica’s favorite activities like surfing, fishing, scuba diving, and much more.